I have been on study leave the past month in order to work on a new book. The generosity of Crestview United Methodist Church, where I work part time, and several generous donors to the Sanctuary Fund have made this gift of time and space possible. I have prayed, listened, written, and rested in the stunning abundance and goodness of God. Did I make progress on the book? Oh yes. I also discovered how much more there is to do. My goal is to complete it by the end of this January. I tell you this so you will hold my feet to the fire. All of you are in my heart and thoughts. Thank you so much for your support and presence in this conversation about our lives together in God. O taste and see that the Lord is good, promises the psalmist. (Psalm 34:8) Yet many people find God hard to swallow, not to mention the side dishes served up with God: religion, piety, doctrine, rules, austerity, judgment, conflict, and war. According to contemporary research quite a few people are not swallowing Christianity. So, you see, it’s something like this, to use an image or a metaphor. And in total exhalation you offer up, give back, go home in redemption. what we oftentimes call in Mystical Theology, original sin. That’s why you go to the monastery, the primary reason anyway. from the world in creation, and especially from God. It’s all, we’re all one. So relax. Quit apologizing. We really don’t have anything to be afraid of, now do we? Holiness seeks intimacy, asks to be consumed, taken in and digested by us in a fundamental, earthy way as food. Fruit of the vine, wheat from the fields grown in the soil, watered by rain, tempered by wind, kissed by the sun. 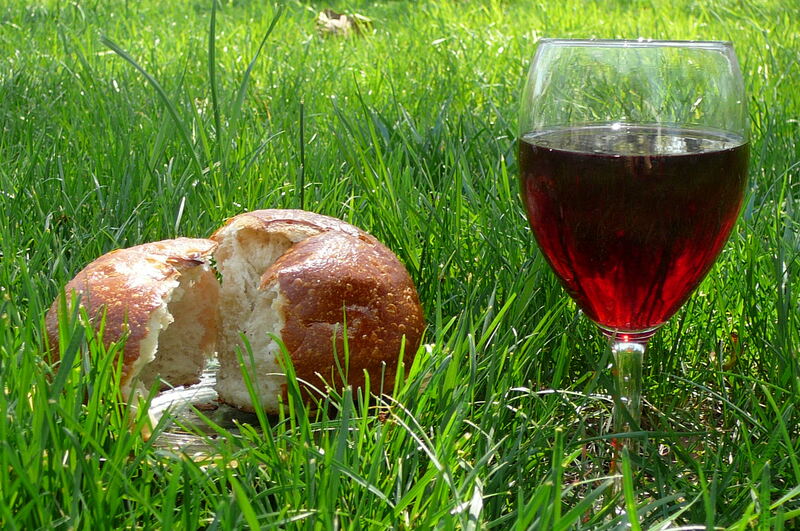 Simple ordinary food becomes transformed by the presence of the one who said, “Here, this bread, this wine is my body. Drink it and it will become your body too.” We get snacks. See. Either we are one with the Holy Spirit or not, eh. then the whole cosmos is sacramentalized, is sacred and holy. see (laughing) and you cannot get out, eh, can’t escape that, even if you wanted to. Not everyone understands God as Merton. A friend and long time church member once confided that one Sunday when the pastor tore off a chunk of bread and handed it to her with the words, This is the body of Christ, “Something happened. I almost gagged and suddenly this seemed like some primitive cannibalistic ritual of eating the body of some person to gain his prana. It seemed repulsive.” She hasn’t been back to a communion service since. Another friend, victimized by a satanic cult, has excruciating flash backs when she goes to receive the Eucharist. Add a few verses of the old hymn “Nothing But the Blood,” and one can imagine most any curious new comer beating a path out the door before the pastor gets out the benediction. For starters let’s take a larger, metaphorical view. 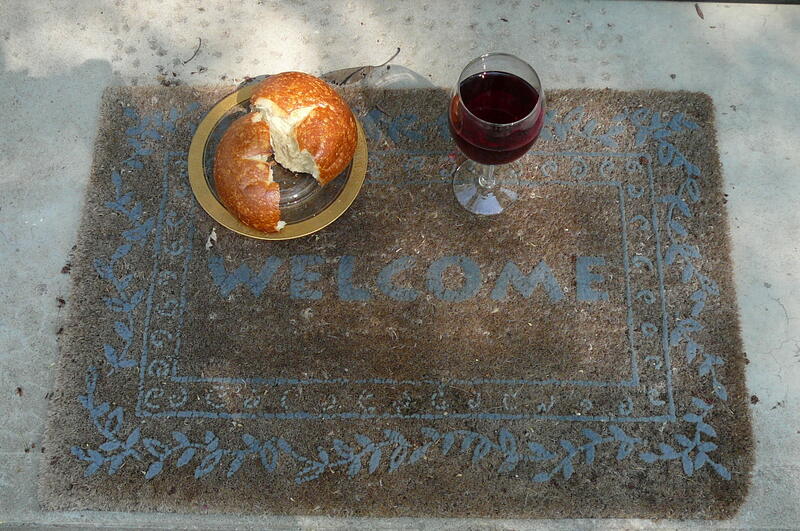 God invites us to eat what is before us, the fundamental reality of our lives, no matter how unsatisfactory. As we taste and see, chew and digest our experience and truth, we are nourished and transformed by the sacred reality of this world. We grow into the likeness of God, holiness itself. In placing us in this life, God has asked us to swallow this world and one another with an inclusive unconditional love. Many times I have preferred to spit it all out. This entry was posted in Contemplation, prayer, Spiritual Formation and tagged body of christ, Christianity, communion, decline in church membership, meaning of eucharist, Thomas Merton. Bookmark the permalink. Great post, very informative. Keep up the good work, Thanks. Keep on writing, darlin’. You are such a gift; you *have* such a gift. Thank you for your faithful sharing year after year. Thank you very much; I honestly was drawn to your page because I am amazed by nature. Thanks a lot for also being the first to comment my blog! This is my first time blogging so I want it to be good. Your pictures are beautiful by the way. I take mostly nature pictures myself. Although, I do love taking nature pics, I also love taking pics of family and friends but professional like pictures. I’ll always be posting. Keep blogging… you’re an inspiration! I’ve credited you and your site, providing links at the bottom of the post. I hope this is OK with you. Of course, I am happy to remove the photo if you would prefer me not to use your content. Thank you so much, Anthony. I took the photo about 7 years ago in my front yard on a whim. I am happy to see it used with your great blog post. Blessings to you!